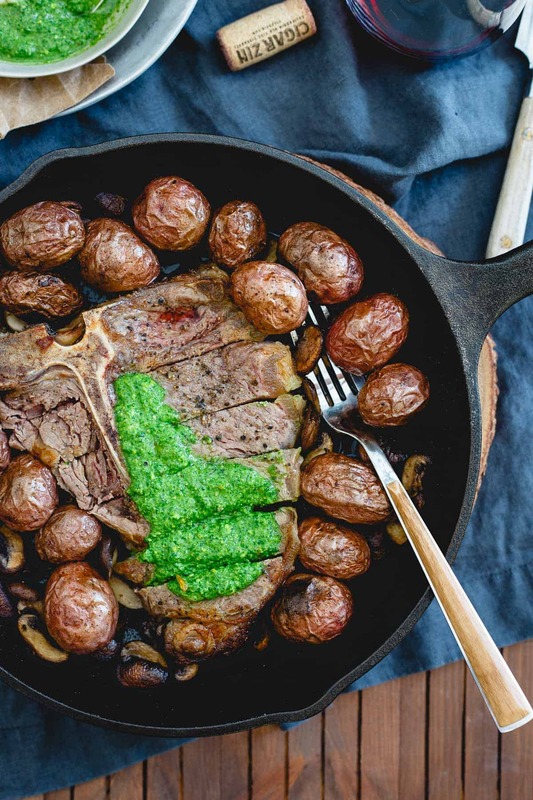 This Porterhouse steak skillet is topped with a spinach horseradish pesto and served up with roasted potatoes and mushrooms for an easy meal all in one pan! This is what we actually ate for Valentine’s Day – alternatively now known in my house as the day I stabbed my husband with a chef’s knife. *This post is sponsored by Flipp, a free shopping tool that brings all of your weekly circulars and coupons to your fingertips to easily find deals nearby and save money. I know I talked a big game about these pistachio crusted lamb chops for the big day but since I made that on the tail end of finishing off 8 pounds (yes, 8) of a leg of lamb I had slow cooked a couple of weeks before, I’ll be honest, we were lambed out. So, beef it was. There’s also something quite appealing about a one skillet meal. 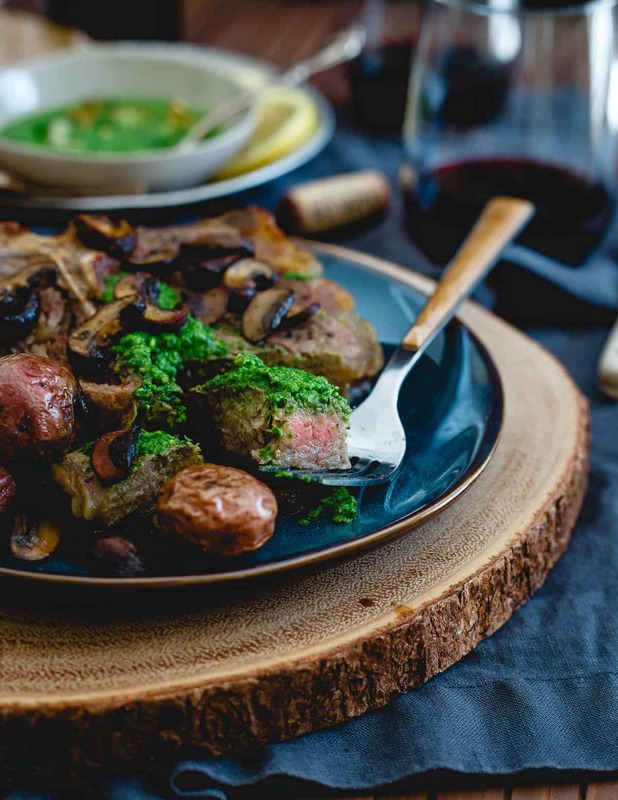 Whether it’s a weeknight dinner or a special holiday, I’m always down with only having one dish to clean up after dinner and this Porterhouse steak skillet is exactly that. It’s all about the layering. You start with the potatoes since they take the longest, add the mushrooms next once the potatoes are starting to get all wrinkly and crispy and then the steak for the last few minutes, it doesn’t take long to get a nice medium rare in a hot skillet! The inspiration for this Porterhouse steak skillet actually came from Flipp, which helps to aggregate coupons and fliers from some of your favorite stores, organizes your grocery shopping list to maximize savings and even plans your store route based on what you need once you’re there with Store Mode, a new feature! I’ve never really been a coupon person, I just don’t have the patience for sorting through all the mailings, cutting things out and then remembering what is on sale where. Flipp does all this for you in one place. 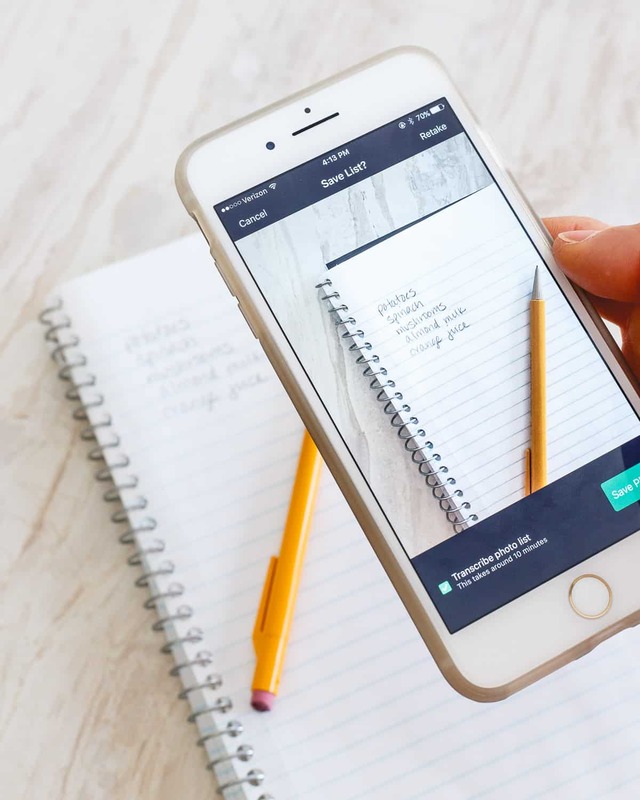 My favorite Shopping List feature though, is Photo List – the automatic transcribing of your hand-written paper grocery list. I’ll always be a pen and paper person so being able to snap a picture of my grocery list and having it transcribed into the app is the best! 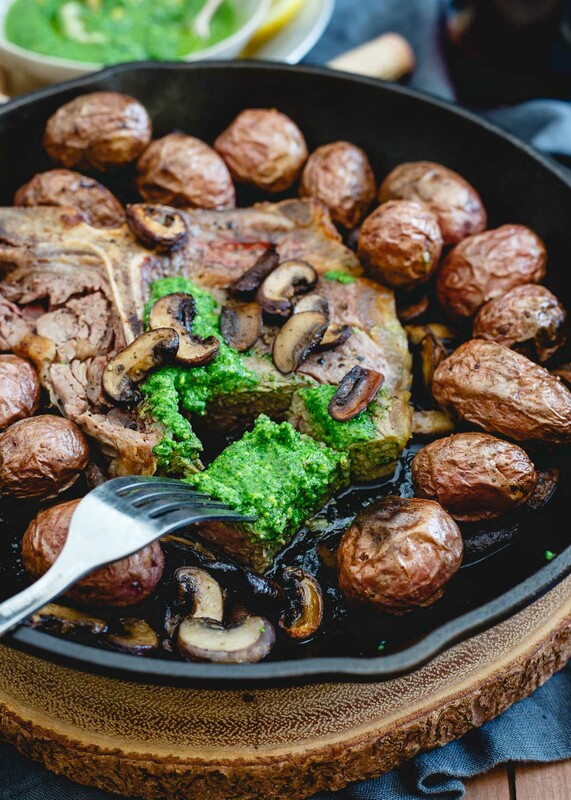 Using Flipp, I noticed that my favorite supermarket circular had mushrooms, spinach and potatoes on sale so this one skillet recipe was dreamed up to go along with the 2 Porterhouse steaks I had in the freezer from our bulk beef share. I grabbed a few other necessities that were on sale as well and the result was $6.51 in savings, just from shopping with Flipp. Can’t complain about saving $6+ on things I would’ve normally bought anyway! 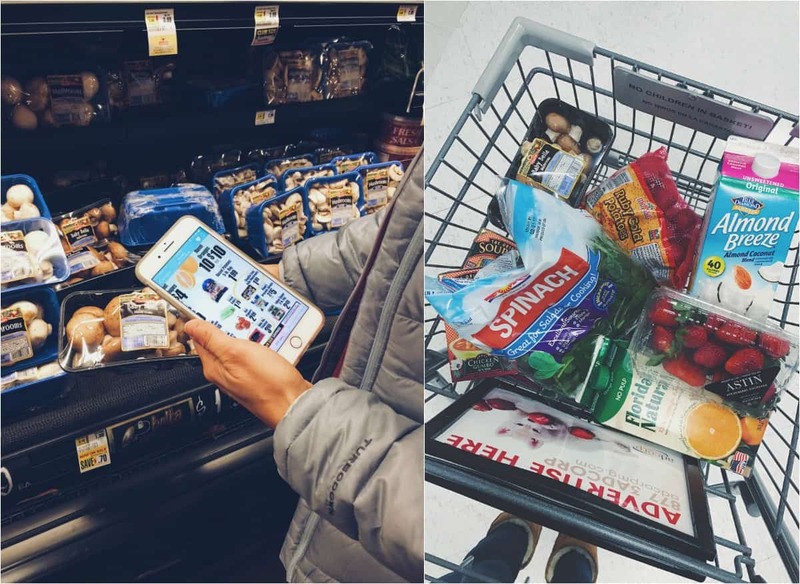 Store Mode is a new feature that is still rolling out to stores across the US, it helps you organize your shopping trip by aisle based on your shopping list. There’s also a Family Sync option so you can share your grocery list and updates with another member of your household, to help keep you on the same page as you shop. So we happily ate this meal on Valentine’s Day, drizzled the spinach horseradish pesto on everything (<– so deliciously tangy and fresh!) and rented Keeping Up with the Joneses (which was ehh but Don Draper, I mean Jon Hamm was in it so I was down). We paused the movie about 3/4 of the way through to clean up and start on dessert (apple crisp for him, lava cake for me). And that’s when I stabbed my husband with my trusty 10 inch chef’s knife. Nothing says Happy Valentine’s Day like blood pouring out of your elbow, huh? It was obviously an accident but his facial expression when it happened was something I’ll never forget and now (that I know he’s not seriously injured) something I’ll probably literally LOL at for the rest of my life every V-Day. Flipp is FREE to download on iOS and Android. To check out Flipp, download through the Apple store or Google Play store and share how much you saved! Check out these other one skillet recipe ideas: chicken artichoke olive skillet | smoky steak potato and pepper skillet and don’t forget dessert with this paleo salted chocolate chip cookie skillet! 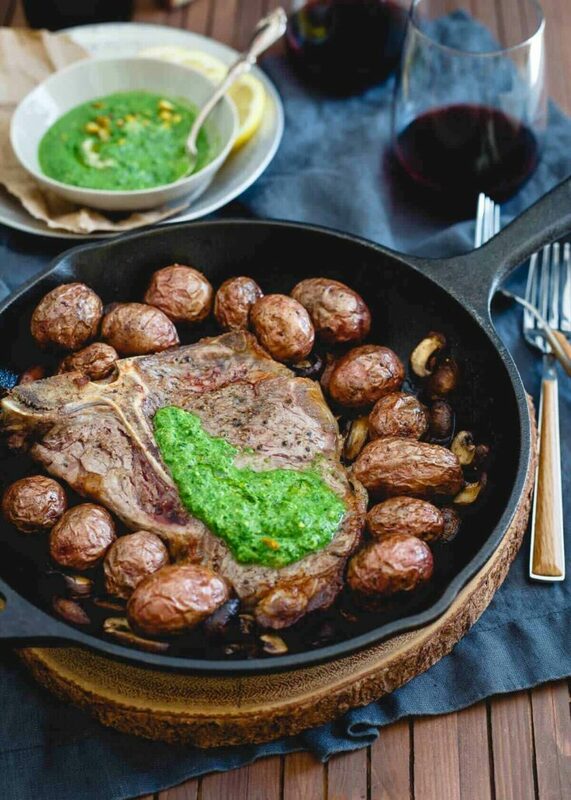 This Porterhouse steak skillet is topped with a spinach horseradish pesto and served up with roasted potatoes and mushrooms for an easy, complete meal! Preheat oven to 450 degrees (use convection setting if you have it) and place 12 inch cast iron skillet in the oven while preheating. Add 1/2 tablespoon of butter to the hot skillet to melt. Place potatoes in the skillet and season generously with salt and pepper. Shake to toss in the butter and roast for about 15 minutes until starting to wrinkle and crisp up on the outside. Add mushrooms to the skillet, season again with salt and pepper and roast for an additional 10 minutes. Pat the steak dry, season liberally with salt and pepper. Turn oven to hi-broil setting. Add remaining 1/2 tablespoon butter to the skillet to melt. Place steak in the middle of the skillet and broil for about 2-3 minutes per side for medium-rare. Remove from oven and serve with pesto. Add spinach, basil, horseradish, garlic and pistachios to a food processor. Pulse until finely chopped. Scrape down the sides. With the food processor running, slowly drizzle in the olive oil until smooth. Add water, 1 teaspoon at a time until you get desired consistency (more for a runnier pesto that can be drizzled). Season with salt and pepper to taste. Flipp is totally genius! I’m a mess with keeping coupons on track! And this steak – you are going straight to my heart! The written to photo list feature is basically genius! I too do not have the patience for coupons or really even going to more than one, maybe 2, stores. I love the idea of having an app that helps me find the best deals without spending hours clipping or driving all over the place. Plus, this recipe looks amazing. These are some of my fav photos of you ever! 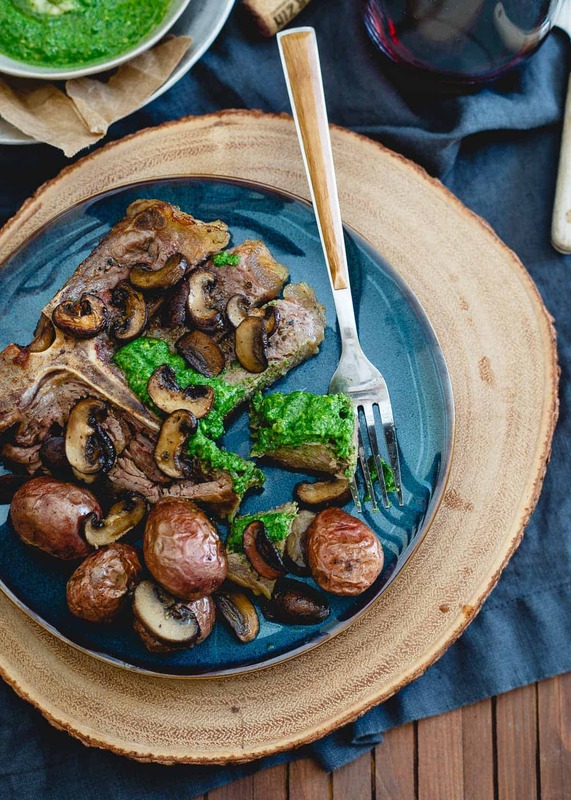 That pesto with this steak is pure GENIUS! What a genius idea, can’t wait to try it! And this dinner, totally up my alley, love it! The spinach horseradish pesto is absolutely genius! That pesto sounds totally dreamy Gina! I think I’d want to put it on everything! I’m a pen and paper person too, so that photo feature is amazing! I can’t wait to check out Flipp, and this dinner too, obviously! Yummy! This was AMAZING!! Super easy & super delicious. I used a combination of red & russet potatoes & added extra mushrooms. I love that it was cooked in a cast iron skillet. Thank you for such a delicious recipe. My family said this is a definite ‘make again’.